These robots help create a sweet "escape" for patients and their families. For Halloween, a duo of friendly robots are putting a sweet spin on trick-or-treating in the halls of one Pittsburgh hospital. Carter is suffering from leukemia, and his mom wanted to cheer him up. A few simple supplies and some creativity are all that's needed. Landri, 6, and Alli and Maddi, both 8, dressed as Mary, Sarah and Winifred. 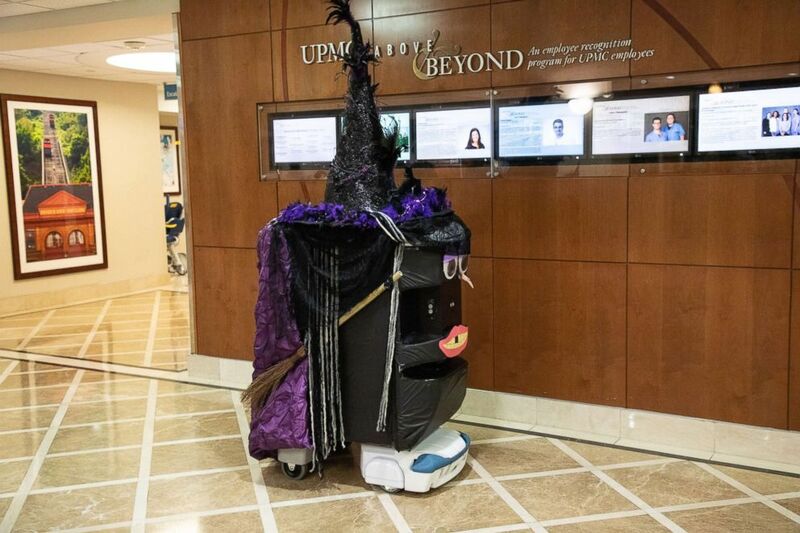 At the University of Pittsburgh Medical Center, TUG robots, which provide medications, linens and meals to patients and pharmacists throughout the hospital, got a spooky makeover. "The robots were programmed to say 'Trick or treat!' or 'Happy Halloween!' when a child approaches," UPMC Presbyterian's Administrative Director of Pharmacy, Alfred L'Altrelli, told "GMA." "One of the robots cackled like a witch for the patients. The robots even had a drawer full of candy that opens up for children visitors and guests." (UPMC) A TUG robot is decorated as a witch for a Halloween event at UPMC Presbyterian hospital in Pittsburgh, Oct. 26, 2018. One robot was dressed up as a witch and another was decked out as a pumpkin and roamed the halls, greeting children with candy. "It was really cool, because I usually don't get to see robots dressed up," L'Altrelli's 8-year-old daughter Addison told "GMA" about seeing the robots dressed up for Halloween. "When the robots came down the halls, people jumped up and down because they were so excited!" "It's an escape for that moment to smile or be distracted for a bit"
"I liked them because they passed out candy," said Pierce Purcell Schantz, 4. This is not the first time UPMC Presbyterian has programmed its robots to be more interactive. They dressed them up for fun educational events at the hospital. "In the past, we have even dressed one TUG up as a pirate and the other as a pirate ship," L'Altrelli said. "The pirate would make 'Arrr' sounds and other pirate remarks, and the pirate ship was filled with gold coins, beads, and other candy." 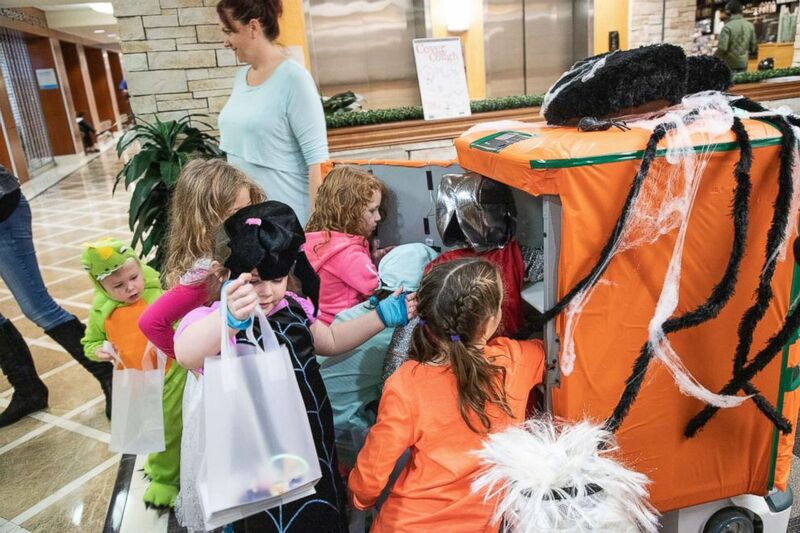 (UPMC) Children in costumes take candy from a TUG robot decorated as a jack-o'-lantern during a Halloween event at UPMC Presbyterian hospital in Pittsburgh, Oct. 26, 2018. L'Altrelli explained that these Halloween robots were not just designed to bring joy to the patients, but to their families, as well. "When you come into a hospital, for some people it can be the worst day of their life," he said. "It's an escape for that moment to smile or be distracted for a bit." Visit Good Morning America's Halloween page for tons of last-minute Halloween hacks from DIY glitter and unicorn pumpkins to makeup tutorials, trendy last-minute costume ideas, recipes and more!